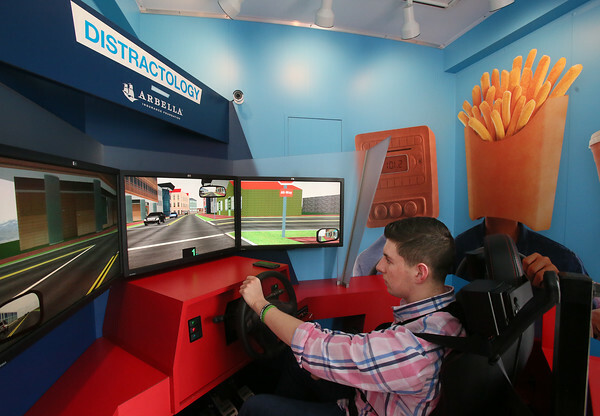 Michael Cody, a senior, takes the wheel of the "Distractology" simulator Wednesday at Gloucester High School. The simulator, which visiting GHS this week through today, is sponsored by the Arbella Insurance Foundation and Eastern Insurance Group LLC. It teaches students about the myriad ways a driver can become distracted, and the potentially disastrous consequences. Over 200 students (juniors and seniors with driver's licenses or permits) have gone through the simulator according to Nick Prpich of Arbella, who oversees the project. "It's a good tool," Prpich said of the simulator. "The students have the privilege of learning things that would take them years to learn out on the road. This is a safe way to learn it."